ROYAL CANIN® is the sole supplier of food for Hearing Dogs for Deaf People, who train dogs to alert deaf people to sounds. Hearing Dogs for Deaf People is a national charity that train hearing dogs to alert deaf people to everyday sounds and danger signals in their home, work place and in public buildings. Hearing Dogs for Deaf People was launched in 1982, at Crufts dog show. Hearing dogs are provided to deaf people at no charge. Hearing Dogs for Deaf People have created over 1,600 life-changing partnerships between deaf people and hearing dogs. However, demand is growing and it is vital they train more puppies to meet this need. Each dog is trained to the specific needs of the deaf individual they have been matched to, creating a life-changing partnership. The life-changing benefits of a hearing dog are so far-reaching that they currently have a waiting list of people who could benefit enormously. 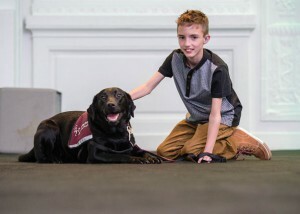 Hearing dogs wear burgundy jackets and lead slips, helping others to recognise an otherwise largely invisible disability. ROYAL Chttp://www.hearingdogs.org.uk/ANIN® is now the proud sponsor of two Hearing Dog puppies. Through National campaigns ROYAL CANIN® have worked in partnership with Hearing Dogs to make more life-changing partnerships by sponsoring two hearing dog puppies through training. By sponsoring a dog, you can help create a partnership between a deaf person and their hearing dog. Matches are made with great care and partnerships are supported on an ongoing basis. Hearing dogs are loved and valued, with deaf people often finding that their lives are completely transformed by the partnership. Learn more about Puppy Sponsorship and sign up today by visiting donate.hearingdogs.org.uk. As a thank you for supporting Hearing Dogs, we are running an exclusive offer for puppy sponsors. Sign up to sponsor a puppy with a monthly donation of £5 or more by Direct Debit and you’ll receive a free bag of ROYAL CANIN® premium dog or cat food. If you have already signed up, then visit the link below, enter your details and your unique code (found on the leaflet in your welcome pack) and we will send you a voucher for your chosen FREE bag. IMPORTANT NOTE: This offer will end on 31st December 2017, no further registrations will be accepted after this date.